Seeing is believing when it comes to parts cleaning. 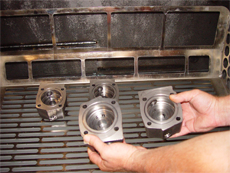 We invite you to personally visit us, or send your dirty parts to our parts washer company in Reedsburg, WI. Bring or send your dirty parts, and we'll clean them at no cost to you. We want the opportunity to prove our superior parts cleaning solutions to you. 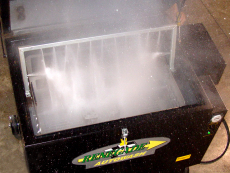 Our parts washer systems can automate the entire cleaning process for you. Our parts washers can take a long hand cleaning and scrubbing process down to a 5-30 minute cleaning cycle without using dangerous solvents. 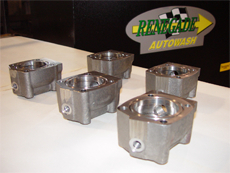 We can even wash your precision parts also. Contact Sales at 800-774-7900 to schedule your free parts cleaning. • We clean your dirty parts at no charge to you. Can't make it to Wisconsin? Send us your dirty parts and we'll clean them for you and return the cleaned parts along with a video of your parts being cleaned. Contact Sales at 800-774-7900 to arrange for shipping your dirty parts to us. Copyright © 2003-2013, Service Line, Inc.